Experience the 2016 Nissan Altima near West Haven, CT! 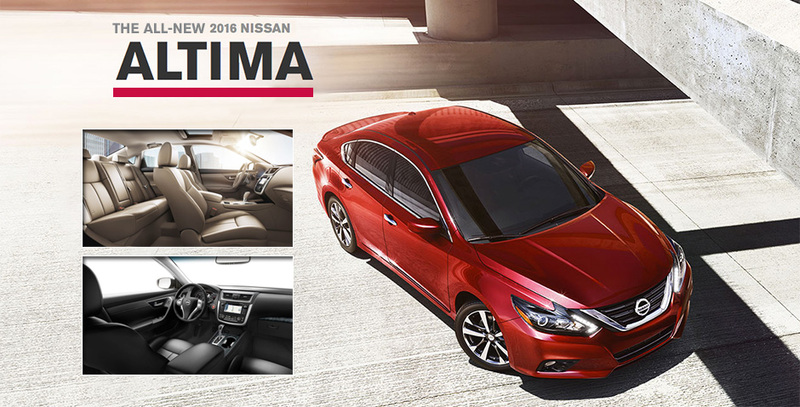 Experience the 2016 Nissan Altima This November near West Haven, CT! Comfort, efficiency and access to a collection of features goes a long way toward pleasing car-buyers everywhere, and the 2016 Nissan Altima is a showstopper in every sense of the word. This sleek sedan will get your pulse racing with its dazzling performance and keep you entertained at every step of the way with its advanced technology. It’ll be on the lot at our Nissan dealership near West Haven, CT, before you know it, so it’s best to start preparing for its arrival right now! From its Zero Gravity front seats to its suite of driver-assistive features, it’s clear that the 2016 Nissan Altima always has your back. Peace of mind comes standard in every new Altima, as getting cozy and staying connected to your favorite apps is never hard to do. Standard perks include Bluetooth functionality and a Tire Pressure Monitoring System with Easy-Fill Tire Alert, while upgrades such as NissanConnectSM with Navigation and Mobile Apps, voice-recognition technology and Siri Eyes Free further spice up the cabin. A power tilt/slide moonroof and leather steering wheel and shift knob are also options for those who want some of the finer things included. The 2016 Nissan Altima is also perfect for travels near and far, whether you’re using it for commuting or pleasure thanks to its versatile performance and first-rate efficiency. The 2.5-liter 4-cylinder engine returns a best-in-class 39 highway mpg, which is ideal for those who are about to set off on their next road trip. Meanwhile, drivers can get some extra oomph by choosing the available 3.5-liter DOHC V6 powertrain that produces 270 horsepower and 251 pound-feet of torque. Plus, with Intelligent Cruise Control and a RearView Monitor, you’ll have plenty of convenience on your side when you’re in the driver’s seat. We’re excited for the arrival of the 2016 Altima at George Harte Nissan, and we’re even more thrilled for the chance to get every local customer the keys to their very own model!